From synthesis to decay, mRNA associates with RNA-binding proteins (RBPs) establishing dynamic ribonucleoprotein particles (RNPs). Understanding the composition and function of RNPs is fundamental to understanding how eukaryotic mRNAs are controlled. This is especially relevant for trypanosomes and related kinetoplastid parasites, which mostly rely on posttranscriptional mechanisms to control gene expression. Crucial for trypanosome differentiation, development, or even response to heat shock, RBPs are known to be essential modulators of diverse molecular processes. The recent application of large-scale quantitative methods, such as Next- Generation Sequencing (NGS) and quantitative mass spectrometry, has revealed new exciting features about the parasite RNA-related metabolism. Novel proteins carrying RNA-binding activity, including many proteins without RNA-related ontology were discovered setting a necessary groundwork to get in insights into RNA biology. Conclusion: This review aims to give the reader an understanding of current trypanosome RNP research, highlighting the progress made using high-throughput approaches. Keywords: RNA-binding proteins, Post-transcriptional control, High-throughput, Gene expression regulation, mRNA-fate, RNA biology. Keywords:RNA-binding proteins, Post-transcriptional control, High-throughput, Gene expression regulation, mRNA-fate, RNA biology. Abstract:From synthesis to decay, mRNA associates with RNA-binding proteins (RBPs) establishing dynamic ribonucleoprotein particles (RNPs). Understanding the composition and function of RNPs is fundamental to understanding how eukaryotic mRNAs are controlled. This is especially relevant for trypanosomes and related kinetoplastid parasites, which mostly rely on posttranscriptional mechanisms to control gene expression. Crucial for trypanosome differentiation, development, or even response to heat shock, RBPs are known to be essential modulators of diverse molecular processes. The recent application of large-scale quantitative methods, such as Next- Generation Sequencing (NGS) and quantitative mass spectrometry, has revealed new exciting features about the parasite RNA-related metabolism. 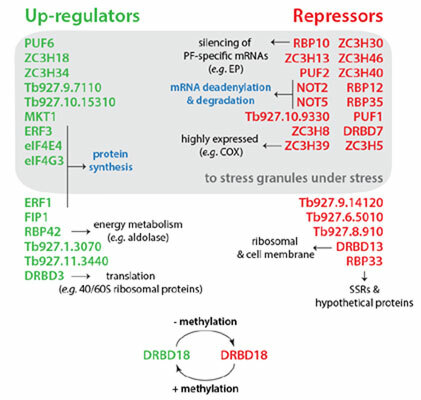 Novel proteins carrying RNA-binding activity, including many proteins without RNA-related ontology were discovered setting a necessary groundwork to get in insights into RNA biology.